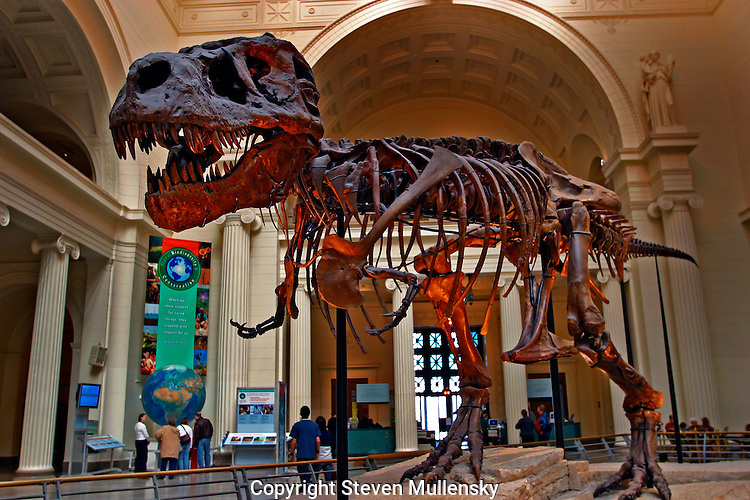 On May 17, 2000 The Field Museum unveiled Sue, the largest, most complete, and best preserved T. rex fossil yet discovered...The skeleton on display is the real thing. Not a plastic model or a plaster cast. Not a patchwork or composite of bones from different specimens...Sue stands 13 feet high at the hips and 42 feet long from head to tail. One of the only pieces of Sue that is not mounted is her 5-foot-long skull, which is too heavy to be placed on the steel armature that holds together her more than 200 fossilized bones. In its place, the Museum has installed a cast replica. Sue?s real skull is on display in an exhibit on the second-floor balcony overlooking Stanley Field Hall. Here, visitors can get an up-close view of Sue?s massive head, as well as some insight into the mounting process and the story of how Sue ended up at The Field Museum. In addition, visitors can view animated CT scans of the skull and touch a variety of casts of Sue?s bones, including a rib, forelimb and tooth.